Week 6 is in the books and here’s what I learned. 69 times. The Steelers are going to get every ounce of production that they can from Le’veon Bell this year. I do not believe he will be a Steeler next year. Antonio Brown is the best WR I’ve seen since Jerry Rice. Only Amari Cooper has been a bigger bust than Martavis Bryant at the WR position. The Browns still don’t have a QB. Copy and pasted every year since 1999. Joe Flacco is tough to watch. It’s really hard to put any Ravens in your lineup right now besides their Defense. Andy Dalton is available in some leagues and should be owned. The offense is on the rise. Downgrade every Green Bay Packer going forward. Jordan Howard is back to being the running back you drafted in the early 2nd round. Pat O’Donnell and Tarik Cohen have as many passing TDs as Mitch Trubisky since he earned the Starting QB job. Not a great sign from the Coach. Marvin Jones should be a high end WR2 the next few weeks with Golden Tate out. The Lions running game leaves a lot to be desired. Jerick McKinnon and Latavius Murray have been getting a similar amount of touches but McKinnon is severely outproducing him. Adam Thielen continues to get it done every week. I really wish Stefon Diggs had some continuity at QB. Jacoby Brissett should have a job in this league for a long time, even if it is only as a backup. Marlon Mack continues to look like the better RB in Indy. There have been few WR in history more overrated than Donte Moncrief from a Fantasy Football aspect. Deshaun Watson is in the perfect situation for someone with his talents. He only had to be average and he has been spectacular. Just start Will Fuller until the gravy train runs out. I wonder if DeAndre Hopkins has dreams where Brock Osweiler is throwing passes at his feet, wakes up and just cackles? Derrick Henry is going to earn the starting RB job before this season is over. The AFC South is up for grabs and Murray is not 100%. Eric Decker is starting to be more involved. Nothing has changed with Jacksonville. Fournette is a Stud and you can start their D most weeks. If you stashed Doug Martin it looks like it should pay off most weeks down the stretch. Mike Evans is a beast even if Ryan Fitzpatrick is throwing him the ball. Jameis Winston should play through his injury from everything I have read. Mark Ingram sure looked like a weight was lifted from his shoulders and sent to Arizona. Ingram and Alvin Kamara should have very defined roles going forward and both should be weekly starters for Fantasy. The Saints Defense scored 3 TDs last week just like we all expected. Somebody needs to tell Steve Sarkisian that they have Julio Jones on their team when they are in the Red Zone next. Matt Ryan is looking a lot more like his 2015 season than his MVP season. Christian McCaffery is coming on a little. Cam Newton is still at his best when he can run for big chunks of yardage. The RB to own in New England may be Dion Lewis by the end of the season. Gronk catch TD. Gronk Spike! Austin Sefarian Jenkins is a Top End TE1 going forward. The return of Matt Forte makes no Jets RB a safe bet on any given week. It’s tough to tell when to start him, but Jay Ajayi is gonna have the numbers at the end of the year. Jarvis Landry continues to quietly be one of the most consistent WRs in the game. There are more questions than answers after the Bills bye week. Charles Clay was the top target for Tyrod Taylor. Can Zay Jones emerge? Lesean McCoy will be given every chance to carry the team. As I am typing this, Zeke Elliott has been cleared to play this week. What an ongoing mess. Dak should be able to exploit the 49ers D this week. The Giants have been looking for a lead back for years. Orleans Darkwa made a statement on Sunday Night. Evan Engram made us forget about that 0 he had in week 5. He is a Top 5 TE right now as a rookie. No WR seems to be worth owning until Sterling Shepard is back on the field. Nelson Agholor is really emerging as a weekly flex or WR3 play. Carson Wentz and Zach Ertz are money in the bank every week. Kirk Cousins threw for 330 yards. His top WR was Ryan Grant with 39. Chris Thompson may lead the team in Receiving yards. CJ Anderson should be much more consistent than he is. Trevor Siemian has come back to Earth since the first two weeks. Kareem Hunt had his worst game of the season in Week 6…and still had over 100 yards from scrimmage. Let’s see if Alex Smith can bounce back from his first loss of the season. Keenan Allen has a tough matchup against the No Fly Zone this week. He has gotten 9 or more targets in every game this season. Melvin Gordon had a slow start but he has feasted on great matchups the past 2 weeks. He is in Elite RB territory now. Hunter Henry is starting to show the consistency we all expected. Now is the time to buy Amari Cooper. I type this as I see him catch a 35 yard TD. He might not be for sale after this game. The best RB on the Raiders is Cordarelle Patterson. I loved seeing Adrian Peterson be a force running the ball again. Opposing Defense’s still don’t like tackling him in the 4th quarter. I said Carson Palmer was done after Week 2. He is currently on pace for just under 5,000 yards passing. Sammy Watkins is so hard to start every week. C.J. Beathard might be a better fit for the 49ers offense than Brian Hoyer was. Carlos Hyde settled back in as the workhorse back last week after Kyle Shanahan played the “hot hand” in Week 5. Jimmy Graham showed some consistency before the bye week. He gets a great matchup with the Giants in Week 7. Paul Richardson could be a sneaky DFS play against the Giants. That’s what it do for Week 6. I’ll holla at y’all next week. I’m your Sweet Fantasy. 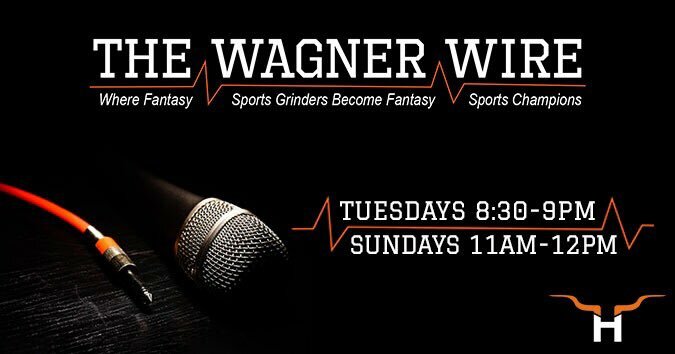 Don’t forget to listen to The Wagner Wire Live on Tuesday’s at 9:30 PM EST and Sundays at Noon EST. Stream it live on hornfm.com or the 104.9 The Horn App.